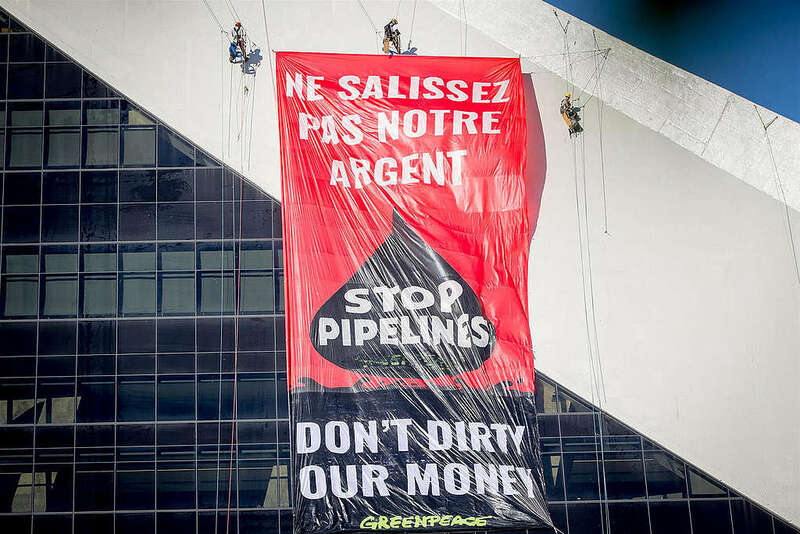 Early this morning, five Greenpeace Canada activists climbed the Olympic Park tower in Montreal to protest the federal government’s Trans Mountain Pipeline buy-out. In just a few days, on July 22, the Trudeau government plans to make a final decision on spending $4.5 billion in public money purchasing Kinder Morgan’s Trans Mountain Pipeline Expansion project, if no other buyer can be found. This action follows another in Vancouver on July 3, when seven climbers, assisted by five others, hung for over 36 hours under the Ironworkers Memorial bridge, to create an aerial blockade in the path of a tar sands oil tanker leaving the Trans Mountain pipeline terminal. There is no safe way today to transport oil. The spill data is clear: pipeline companies Kinder Morgan, Enbridge and TransCanada have had an average of one spill per week in the United States alone since 2010. The risks of spills, leaks and increased tar sands production are a serious threat to vital water resources that communities and wildlife depend on. Increasing tar sands oil transportation and export capacity means significantly increasing production — but we can’t keep expanding the tar sands if we want a safe, livable climate. The world does not need more oil, it needs more climate leaders. The majority of Indigenous communities along the pipeline route did not give their free, prior and informed consent to this project. These rights are protected under the United Nations Declaration on the Rights of Indigenous Peoples. There are only 75 southern resident killer whales left in the world and they live mainly in the North Pacific. A sevenfold increase in oil tanker traffic to 400 tankers per year in these waters could force them to extinction. We cannot let Justin Trudeau risk taxpayers’ money and our future on this pipeline. Scientists are clear: for a livable climate, we need to leave 80% of known fossil fuel reserves in the ground. Pumping billions of dollars into a pipeline project is a bad investment for the future. Tell Justin Trudeau to stop the Trans Mountain pipeline project now. Thank you for your courage and bringing more attention to the rest of Canada that expanding pipelines and fossil fuel consumption is dangerous to the future livability of our planet. Thank you, thank you so much for keeping this dreadful pipeline on the front pages. Many thanks to everyone protesting this terrible venture. How can we thank you for your Herculean efforts to stop this pipeline. We are CPOC. Communities Protecting our Coast. Living on Vancouver Island we know limitations. Let’s get the tarriff off solar and the subsidies off oil! What GUTS. Thank you so very much. Thank you, Greenpeacers, for your courage and dedication. You're all very brave and I've admired you all and your organization for many years. Please keep it up. This planet would be even more lost than it already is, without brave activists like you.